To navigate the botany transcription page, please use the blue tabs/arrows near the top of the main box, which have the labels "General:, "Collector Details" and "Location". Be sure to type in all the information you can for the fields in each section before you click the orange [Complete and Mark for Review] button. 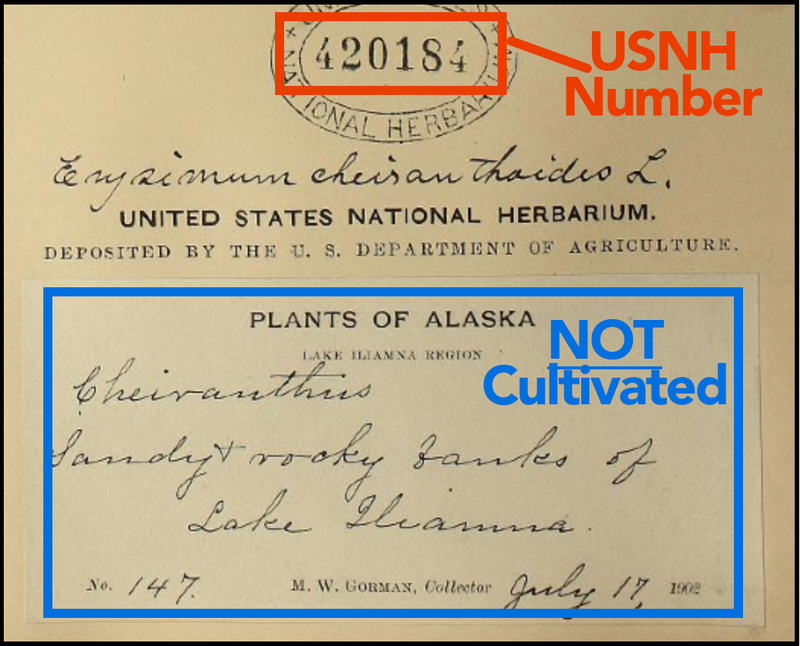 This is the United States National Herbarium number and should appear on every plant specimen near the label. It is surrounded by the words “United States National Herbarium”, often inside an oval. This number should be recorded for every specimen. If no USNH number appears, please write "None Stated" in the field. Most specimens are collected from nature. Sometimes, specimens are acquired from people growing or "cultivating" them in man-made environment. The label will often say either “Cultivated at [placename]” or “collected at [this place], cultivated at [that place]”. If this plant was definitely grown by people (rather than in nature), check the cultivated checkbox. In this example, the plant is NOT cultivated. This is the number that the collector assigns the plant specimen. This number can often be found near the collector name or next to the taxonomic name. If there is no number indicated, please write “s.n.” In the example here, the collector number is “147”. This is the date the specimen was collected. Please transcribe the date using YYYY-MM-DD notation. The date may be as little as “1888” or “May 1888” or sometimes even “188-“ . If missing, leave blank. In the example about, the date is “1902-07-17”. If a range, please indicate earlier date in first field and latter date in second field. These are the people involved in collecting the plant. Please write them in using a [last name], [first name or initials] format (without the brackets). Click the “Add collector” link to add another text field to include additional collectors. If missing, write “collector unknown”. 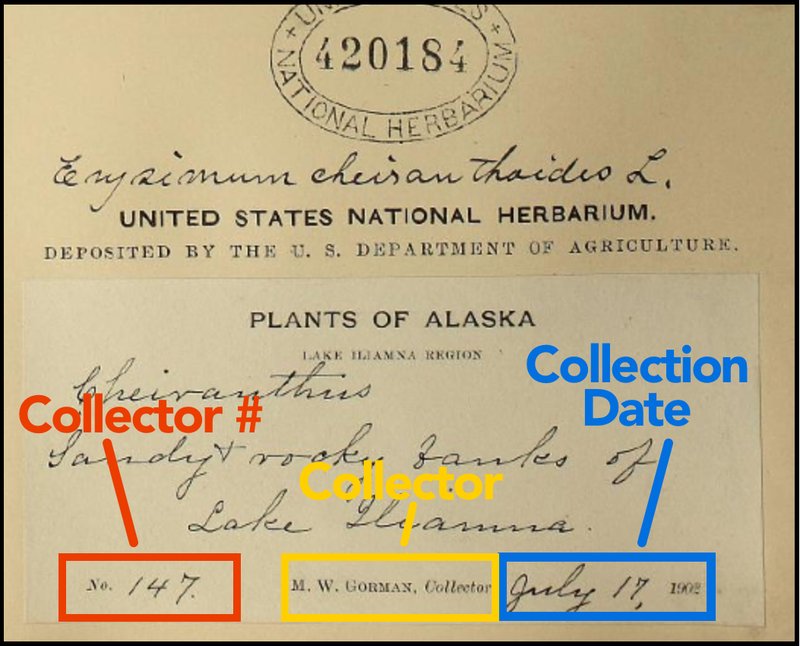 In the example above, the collector is “Gorman, M. W.” Please use collector names from the autosuggest list as your first choice. Understanding where a plant was collected (or cultivated) is very important for conservation and distribution research. Scientists use this information to determine the rarity of the plant species, and where the plant can be found in the world. A tool you can use to clarify locations is http://www.geonames.org/ which can help you determine the current state/territory place name that plant was collected in. You can also Google locations - this is something scientists and botanists do as well. The country where the plant was collected or cultivated. If missing, leave blank. Use currently accepted name for the country. In this example, we can infer the country is "United States of America". The second level of geographic division inside country where the plant was collected or cultivated. If missing, leave blank. Use currently accepted name for the State / Territory. In this example, the state is "Alaska". The local area inside the region where the plant was collected or cultivated. If missing, leave blank. Use currently accepted name for the District / County. In this example, the district is inferred by typing "Lake Iliamna" into the search box in http://geonames.org and seeing that it is a part of "United States, Alaska, Lake and Peninsula Borough". You should type that third element - "Lake and Peninsula Borough"
Any detailed information about where the plant was collected that goes beyond country, state, district, lat-long. If missing, leave blank. Transcribe the locality verbatim. If unsure of the spelling of a locality, please add [sp.?] to the locality. If there is an alternate or corrected spelling, please add this in brackets to the locality. 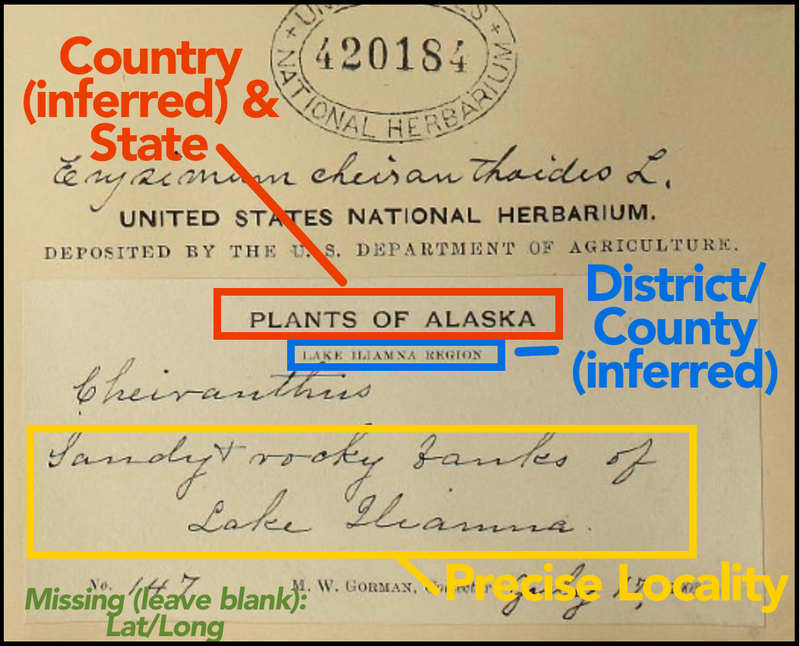 If indicated on the label, record the exact latitude of where the plant was collected. If in decimal format, type into the first (degrees) field. If missing, leave blank. The numerical value of the elevation that the plant was collected from, without the unit. If there is one elevation, enter this in the Elevation From field. If there is a range, such as 400-600 m, put Elevation From = “400” and Elevation To = “600”. If missing, leave blank. The unit of measurement for the previously stated elevation range. The notes section is only for communicating any questions or concerns to Smithsonian staff, as well as other volunteers, about this transcription. For instance, if you aren't sure about the precise locality, but you did your best guess, you can indicate that here. Or if you are a reviewer and wanted to make a comment to staff or other transcribers, you can do that here. Final example - if you find that typed material and handwritten text conflict with one another, make a judgement call and then include your decision (and why) in this field. There may be additional collection labels on the page which may assist you in transcribing this specimen. If the labels contain conflicting information, use your best judgement and include the information in the notes. Some details are very important to the botanical specimen transcriptions. Providing accurate data, correctly transcribing the names of the collectors and localities, using Geonames.com to identify the correct territories, utilizing the autosuggest lists (when possible) - these are all very important to us. Other details, such as punctuation or brackets to field entries, or the format to indicate a name you are unsure of (such as “[? ]” or “[sp.? ]” or “? ?” ) are not as important. Please do not spend too much time on these details that can be easily fixed by our database managers. We want data that is searchable and findable, but not necessarily perfect in all matters of formatting. We would much rather have your time spent on more transcriptions than creating a perfect masterpiece of one transcription! And as always, you can get in touch with ways we can make our instructions more useful.